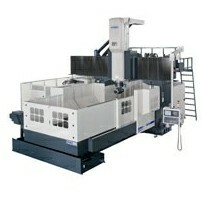 Manufacturer of Vertical Machining Centers and CNC Milling Machines. *Precision gear-type clutch. Indexing accuracy ±3 seconds, repeatability 1 second. *3,500rpm spindle with horizontal head provides high cutting efficiency. *The precision gear-type clutch of 280mm large external diameter features high rigidity. Such design provides stable angular position and deformation-free operation for heavy cutting task. *The internal rotation face of the horizontal head is coated with PTFE material. Such design requires less rotation torque and extends sliding face lifetime. *The horizontal head is equipped with large-sized clamping jaws. *Larger contact faces feature well-dispensed stress and high parts stability. *Obvious grease inlet can also be used as oil window for maintenance. *The horizontal spindle head incorporates tool clamping mechanism as one-piece structure, which saves space and time. *A level surface at the exterior of the horizontal head is parallel to the spindle. This is a handy design for calibrations and accuracy inspection.